““One would be led to think.., that Adam Smith concluded we were under some necessity” (this is indeed the case) “of producing a surplus of corn, woollen goods, and hardware, and that the capital which produced them could not be otherwise employed. It is, however, always a matter of choice in what way a capital shall be employed, and therefore there can never, for any length of time, be a surplus of any commodity; for if there were, it would fall below its natural price, and capital would be removed to some more profitable employment” (l.c., pp. 341-42, note). ““Too much of a particular commodity may be produced, of which there may be such a glut in the market, as not to repay the capital expended on it; but this cannot be the case with […] all commodities” (l.c., pp. 341-42). “Whether these increased productions, and consequent demand which they occasion, shall or shall not lower profits, depends solely on the rise of wages; and the rise of wages, excepting for a limited period, on the facility of producing the food and necessaries of the labourer” (l.c., p. 343). Money does not just act as means of circulation. It also acts as unit of account, means of payment and store of value. In all of these functions, it can also play a role in crises, as it comes into conflict with its other functions. Moreover, as means of circulation, money does not just interject in the process of exchange of commodities, which reflects the unity of purchase and sale, but by its very function, as an intermediary in that process, is the means by which that unity is dissolved into its two opposing and contradictory poles. When commodity A exchanges, in a system of barter, for commodity B, the unity of the exchange is reflected in the fact that the purchase of B is simultaneously, and necessarily, the sale of A, and vice versa. But, when A is purchased by the owner of B for £10, this act no longer implies the sale of B to the owner of A, for £10, or indeed the sale of B to anyone. 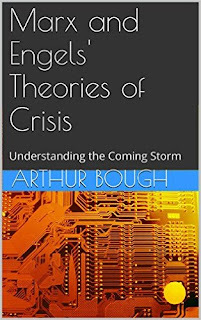 Those who studied and wrote about the actual crises of overproduction that regularly occurred, after 1825, therefore, ignored what the textbooks said about the impossibility of such crises, in theory, and described the reality of those crises in practice. The bourgeois theorists and apologists, however, continued to ignore the reality of the recurring crises, and instead contented themselves with arguing that, if only the economy, and its participants, would behave as their theories told them they should behave, then the crises would be avoided. In the 20th century, the same approach has been taken by the Austrian School, on one side, and the Keynesians, on the other. The contradiction does not reside in an absence of the unity that the apologists insist exists, but in the fact that the unity itself is based upon a contradiction, and, in fact, a series of such contradictions exist. The crisis does not arise because of an absence of unity, but as the means by which the unity is manifest, and violently enforced, whenever its two contradictory aspects have become independent of each other. The commodity is a contradictory unity of use value and exchange value, but if the latter becomes too separated from the former, their unity is enforced by a crisis. For example, no commodity has exchange-value unless it has use value for someone. It may be possible that, even as this use value declines (falling marginal utility) the commodity still acts as a commodity, i.e. it can be sold in exchange for exchange-value, so long as its price declines accordingly. But, if the separation of the two becomes too pronounced, the commodity loses all of its exchange-value suddenly, as no one seeks to buy it. Or, more likely, its exchange value/price falls to such a level that it no longer enables the capital consumed in its production to be reproduced. Marx makes this point in Capital III, where he sets out that in talking about the average socially necessary labour-time required for the production of a commodity, this does not just mean in relation to each commodity unit, but in relation to the total output. If more units of a particular class of commodity are produced than there is demand for, at its exchange-value, then the excess is an expenditure of unnecessary labour-time, and does not count as value creating. Similarly, purchase and sale are separated, but it is only when they become completely independent of each other that this erupts in a crisis, which forcibly restores their unity. Frank Field Resigns - Hurrah!!!! Is Wonga Today's Northern Rock?